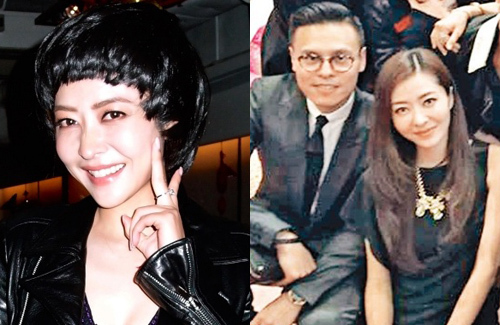 At the annual celebratory dinner held by her management company, Lynn Hung (熊黛林) revealed that she is engaged to businessman Ken Kwok (郭可頌). Although the couple only started dating last year, Lynn was ecstatic when Ken proposed with a three-carat diamond ring. The younger brother of Kenix Kwok (郭可盈), Ken inherited the family business when their father, Kwok Dat Cheung (郭達昌), passed away in 2011. An entrepreneur himself, Ken currently serves on the executive board of five companies. The 37-year-old’s assets are valued over $100 million HKD. Previously married in 2012, Ken was divorced before he started officially dating Lynn last year. The couple’s marriage rumors have been active for months, especially since Kenix has praised Lynn and openly treated her like family. When Lynn joined the Kwoks on their family holiday to Okinawa, Japan during Christmas last year, there was already speculation that the couple would get engaged. was awarded “Artiste with the Biggest Breakthrough” for her participation in the Mainland Chinese variety program, Law of The Jungle<叢林的法則> (based on the original South Korean variety program of the same name). As a participant in the program, which forces participants to rely on rudimentary survival skills in the remote outdoors, Lynn could not brush her teeth or bathe for five days in a row. Lynn had another cause for celebration, as Ip Man 3 <葉問 3>, in which she played Ip Man’s wife, has been posting outstanding box office results in both Hong Kong and Mainland China. It was no wonder that Lynn looked radiant with joy that night. Very happy for Lynn. I think she has wanted to get married for a long time, but, Aaron was not ready yet (Aaron always said he love kids and want to have a family, but, always said there are still things he want to do first). Now, she finally found a man who is willing to step into the next stage of life with her, and building a family with her. she wasted 7 years on a man who doesn’t want to get married. but she has hooked another big fish. she is lucky. really happy for lynn that she finally found a good and family man for which i see she is a family woman too..
she has found a rich man.